This isn't the first reflection to try and understand the position that the eldest son finds himself in, but it does manage to get to the heart of the question of family dysfunction in a fresh way, I feel. Luke 15:25-28a "Now his older son was in the field. And as he came and drew near to the house, he heard music and dancing. So he called one of the servants and asked what these things meant. And he said to him, 'Your brother has come, and because he has received him safe and sound, your father has killed the fatted calf.' But he was angry and refused to go in.'" Finally, we meet the elusive oldest son. And like his younger brother, Jesus' audience would have been surprised to find out that he is not a typical oldest son. He is no Cain, or Ishmael, nor Esau... he is not a conventional older brother as far as their stories were concerned. My birth was just one of many earth-shattering events (he he...) that took place in 1968. The following article tells of another... the remarkable story of the forgotten man on the Olympic 200 metres podium the night of the famous black power salute by 2 black American athletes and the friendship that developed with their fellow medalist, Australian sprinter (and still national 200 metres record holder) Peter Norman. Sometimes photographs deceive. Take this one, for example. 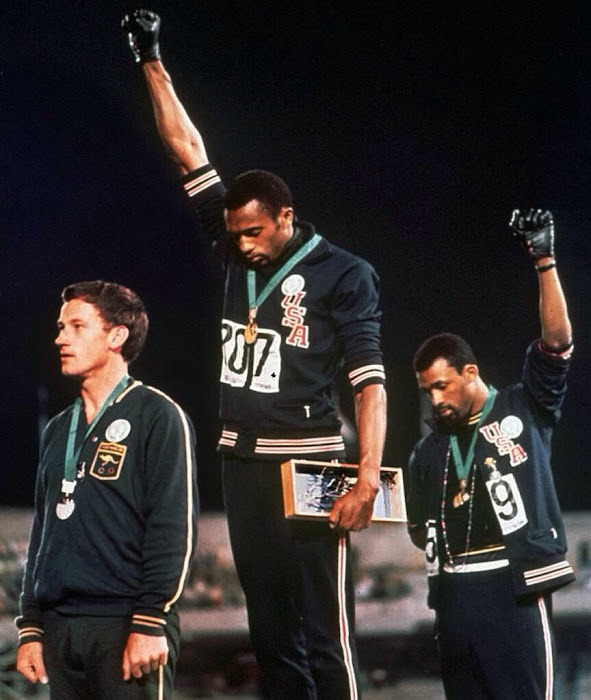 It represents John Carlos and Tommie Smith’s rebellious gesture the day they won medals for the 200 meters at the 1968 Summer Olympics in Mexico City, and it certainly deceived me for a long time.